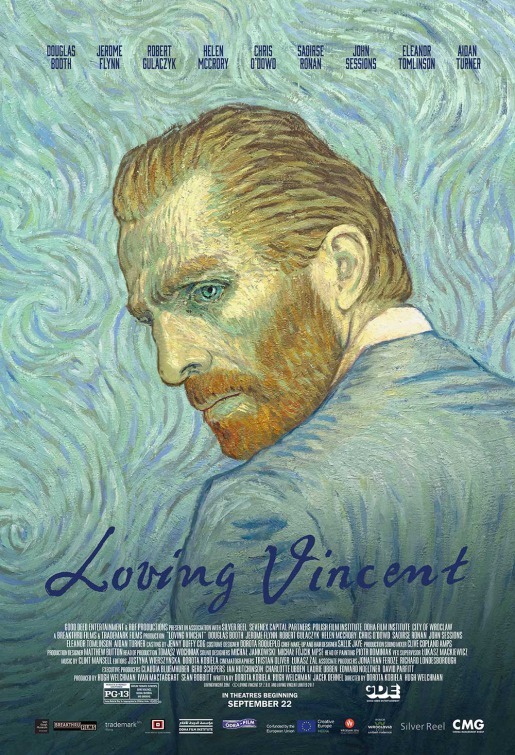 Synopsis: In a story depicted in oil painted animation, a young man comes to the last hometown of painter Vincent van Gogh to deliver the troubled artist’s final letter and ends up investigating his final days there. Review: Sometimes I am my own worst enemy. For months now, I’d been hearing critics sing the praises of Loving Vincent and proclaiming it to be a sure-fire nominee for Best Animated Feature Academy Award and a front-runner for taking home the big award on Oscar night. Yet I resisted seeing it for all this time, nearly getting cold feet again when it popped up at my local second-run movie theater. Could a film that is entirely hand-painted in the style of Vincent van Gogh keep me interested (and awake) for 94 minutes? Oh yes. Oh boy, yes. A true work of art, Loving Vincent is a Polish-British production and is the world’s first fully painted feature film. A vibrant mix of colors and ideas, it’s not a straight biopic of the Dutch-born painter who was posthumously proclaimed to be the father of modern Expressionism but a look back at his last few months as seen through the eyes of those that knew him. Van Gogh’s own portraits inspire many of the characters in directors Dorota Kobiela & Hugh Welchman’s film and while the story may not hold up in court as entirely factual, the tale it tells is absorbing and enthralling. A little over a year after van Gogh’s death by self-inflicted gunshot, Armand Roulin (Douglas Booth, Noah), the son of a postmaster (Chris O’Dowd, The Sapphires) who was friendly with van Gogh, is tasked with delivering the painter’s final letter to his brother, Theo. This begins a journey that takes him to the small village of Auvers-sur-Oise near Paris where a mystery about van Gogh’s final days begins to unfold. Through recollections by various townsfolk that are relayed in stark black and white, Armand starts to piece together what led the painter who long struggled with depression to take his own life in a most unusual manner. Will the doctor (Jerome Flynn) who treated him and became his friend provide any insight? What about the doctor’s prim daughter (Saoirse Ronan, Lady Bird) or their upright housekeeper (Helen McCrory, Skyfall)? Then there’s the boatman (Aidan Turner, The Hobbit: The Desolation of Smaug) and a proprietress (Eleanor Tomlinson, Jack the Giant Slayer) of a local hotel where van Gogh took his last breath. All provide valuable clues that propel Armand further into needing to know the truth. Over 100 artists worked on this film and it’s really a spectacular sight to behold. Everything in the past seems to have been created with a charcoal hue while the present proceedings jump off the screen with van Gogh’s famed thick layers of oil and paint. Even when nothing is moving on screen the film still seems to have a life of its own as the colors and hues change to give more depth. It’s highly imaginative and not the least bit the tough on the eyes watch I feared it may be. With all due respect to Pixar’s Coco (which is a landmark achievement of its own), Loving Vincent surely represents the best animation had to offer in 2017. The Oscar should go to the film that pushed the boundaries the most and gave audiences something they’ve never seen before. The craft on display here is unparalleled and worthy of taking home the prize when all is said and done. Loving Vincent is currently playing in select theaters but is also available to rent/buy on streaming services and in physical DVD/BluRay. Check it out – it will be money well spent.